Does everyone else’s kids ask for snacks every 2 minutes or is that just mine? ? I came up with this idea last summer when the kids were on break and snack crazy. I got a large Tupperware container and I put it on the lower shelf in the pantry where they can reach and I fill it every few days or so with some semi-healthy snacks. This way when they ask for a snack they know their options and are able to go get one themselves. Even my youngest who can barely reach the door knob to the pantry knows where the snacks are. I find myself often times filling it with the same things over and over but if it keeps the kiddos happy, then I’m happy. 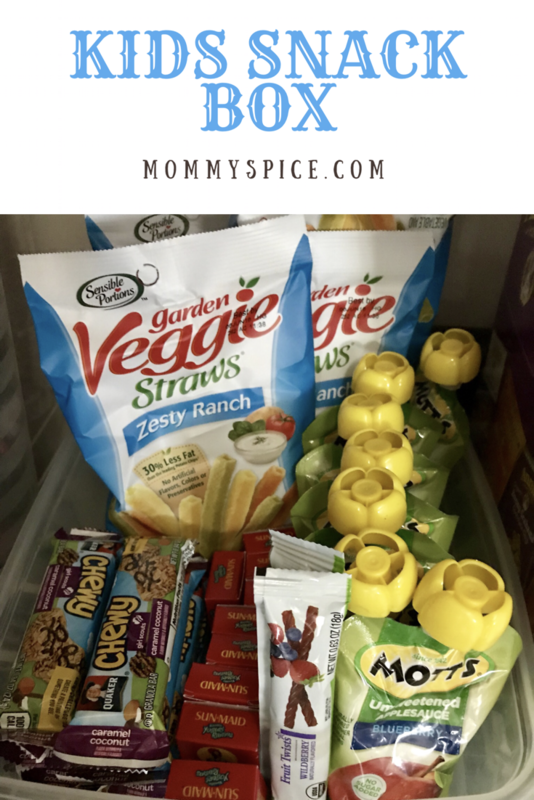 A way I do try to keep things fresh is different flavors of snacks they already love. Motts has a bunch of different flavors of the no sugar added applesauce pouches, also alternating between healthier fruit snacks, and the not so healthy but way cooler character ones. Different kinds of granola bars are another staple, sometimes I get the soft fruit filled ones, other times chewy chocolate ones. 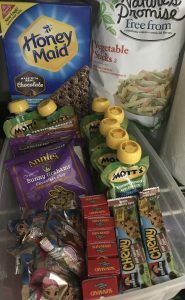 My oldest is in elementary school, and has to have a snack packed everyday for school, so we have no shortage of snacks in our house. The kids are also more than helpful to let me know when the snack box gets low. Sometimes individually wrapped items can run a little more expensive, makes sense though, you’re paying for the convenience and additional package materials. 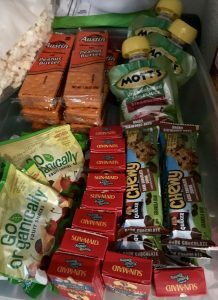 That being said, I will occasionally put other snack options around the snack box to add more choices. 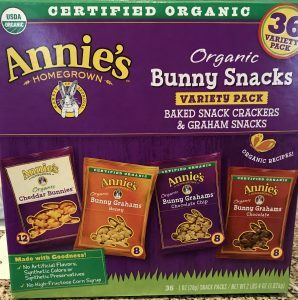 This “Bunny Box” as my kids call it, are some of their favorite snacks! Four different varieties of flavors, color coded and all individually packaged. Perfect for lunch boxes or on the go snacks. I can sometimes find these at Costco but they don’t carry them consistently, I usually just order them online. They come with 36 snack bags. Also these bunnies would be the perfect addition to any Easter basket as a healthy but still on theme treat.